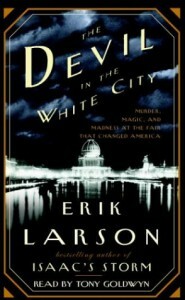 I didn't love this book as much as the first novel I read by Larson. It seemed, somehow, full of shorter and choppier sentences, even though that's not truly the case given how long and explanatory some sections were. That was just the impression I came away with after reading a few chapters at a time. I had previously known about H.H. Holmes via documentaries that air around this time of the year about serial killers - thanks Investigative Discovery! - but the Chicago world's fair was pretty fresh territory for me. I am amazed at how vicious politics and city pride can get, and then amazed again that things really were so much worse back then in terms of living conditions and standard quality of life; really, how did they manage to pull off that fair? How did anyone survive prior to the 1950s? Carcasses in the streets, in the water supply, transportation vehicles falling off bridges regularly, pollution so thick it literally changes the colors of your environment. Dude, I can't even drive through Los Angeles without triggering an asthma attack, JFC. Fire, fire everywhere. And a huge massive outdoor slaughterhouse?! I admit to being a wimp and liking my food dead-dead. Slaughter is necessary, yes, but so close to the city...? Disease central much? No wonder so many people went missing during the period of time the fair was open and no one realized until afterwards. It was so chaotic just living every day to day life. -- "Great murderers, like great men in other walks of activity, have blue eyes." I read or heard somewhere once that as the majority of the human population has brown eyes, we tend to find blue eyes attractive due to its rarity (due to being a recessive gene). "Found bodies went to the morgue; if unclaimed, they traveled net to the dissection amphitheater..."
"[Doctors] frowned on murder as means of harvest [of cadavers]..."
-- "The photographs of these new [Kodak No. 4] cameras created were fast becoming known as "snap-shots," a term originally used by English hunters to describe a quick shot with a gun."